Trent Davis, counselor and coordinator of Virginia Tech’s Animal Assisted Therapy at Cook Counseling Center, and his dog Moose, a 7-year-old therapy dog. Moose, the 7-year-old therapy dog, just doesn’t care, and that is perhaps his greatest superpower. “Moose loves you if you’re super smart, and he loves you if you got an F. He loves you if you’ve been in the hospital, and he loves you if you’re a sports star,” said Moose’s owner Trent Davis, counselor and coordinator of Virginia Tech’s Animal Assisted Therapy at Cook Counseling Center. “Moose doesn’t care if you have a mental health concern. He doesn’t care if you got an A or a B or if you didn’t get into college … That’s got a magic to it,” Davis said. During the past five years, the therapy dog has partnered with Davis in more than 5,000 individual and group counseling sessions, done countless hours of outreach, and has become one of Virginia Tech’s most beloved celebrities. “He went to seven graduations last year,” said Davis of the yellow Labrador, whose face adorns thousands of stickers around Blacksburg and beyond. Last month, Moose’s work was put in the spotlight when he was named the Virginia Veterinary Medical Association’s (VVMA) 2019 Animal Hero during their annual conference at the Hotel Roanoke. First presented in 2004, the annual award is given to an animal that has performed a heroic act of service or provides daily outstanding service for humans. Moose not only embodies those qualities, but also highlights the VVMA’s increased emphasize on mental wellness. Moose was nominated by Heidi Garmen, a fourth-year Virginia-Maryland College of Veterinary Medicine student. She said Moose was an integral part of the school and had helped her personally overcome the loss of her own therapy dog, a yellow Labrador named Luke. Born and raised at Guiding Eyes for the Blind in Yorktown Heights, New York, Moose’s formal guide dog training stalled when he was diagnosed with a minor kidney issue. The timing of his dismissal coincided with Davis’ search for a new therapy dog in Blacksburg. “He came back here on a Sunday and started working on Monday, and he’s been working full-time ever since,” Davis said. 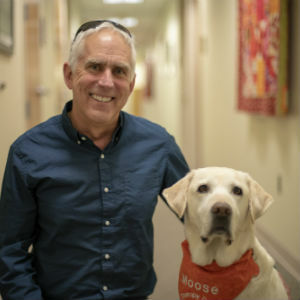 Davis said Moose’s unmerited love and ability to be “present” has been a great asset to Cook Counseling Center’s mission to serve a student population, many of whom are facing stress and change at a time in life when mental health issues often first arise. Moose’s positive vibes have made discussing hard topics easier and led to clients missing fewer appointments. They’ve led to him visiting the veterinary college multiple times a week, working at monthly “Paws to Read” program at the public library in Blacksburg, and helped cultivate, “Moose’s Group,” a session composed of students who have been hospitalized. “They really come to the group in large measure because Moose is there,” Davis said. Since Moose’s arrival, Cook Counseling Center has added two more therapy dogs to its pack. Like Moose, Derick, a yellow Labrador, also came from Guiding Eyes for the Blind, while the black Labrador Wagner was donated by the Charlottesville-based Service Dogs of Virginia. And the work of the Animal-Assisted Therapy program has gained a national reputation with multiple universities across the United States seeking their advice and multiple conferences inviting them to present. Moose’s work with clients is impressive, but Davis said the dog’s greatest feat has been to help tear down the negative stigma often associated with mental health. For example, in the past, students were often hesitant to let people know they are seeing a therapist, but Moose has changed that. own on a Friday night,” Davis said. Davis believes Moose’s presence both on campus and on social media channels has also helped tear down mental wellness stigmas by advocating for the variety of services and assistance offered by Cook Counseling Center. “I think that’s his biggest role, to reduce stigma by popularizing himself and being associated with therapy,” he said. Whether it’s the 15,000 Moose stickers that have been given out since August or the more than 4,000 people who follow him on Instagram, Moose’s soft, floppy ears and warm brown eyes have helped tear down many barriers between people and the center’s services. “He’s been a pioneer,” Davis said.